General Specifications for the 1966 Buick 401 and 425 Cubic Inch Engines The following information has been directly complied from original Buick service manuals for the respective year of vehicle manufacture. These specifications should also be correct for the 1966 model year. Use a reliable torque wrench to obtain the figures listed below. This will prevent straining or distorting the parts as well as preventing thread damage. These specifications are for clean and lightly lubricated threads only. Dry or dirty threads produce friction which prevents accurate measurement of the actual torque. It is important that these specifications be strictly observed. Over tightening can damage threads. This will prevent attainment 'of the proper torque and will require replacement of the damaged part. 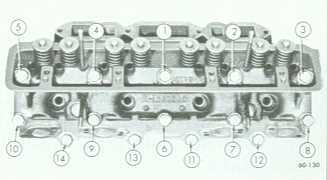 Buick Nailhead head torque pattern. Piston Displacement 400 & 401 Cu. In. 425 Cu. In. Carburetor Type 4 Bbl. 4 Bbl. With Air Conditioning 18.27 qts. 401 Cu. In. 425 Cu. In. *A11 Measurements in Inches Unless Otherwise Specified. * Measure next to valve in recess, or 1.540" from the rocker cover rail. 401 4.1875 3.640 6.220 0.967 1.7088 1.1504 4.750" .025 10.0"
425 4.3125 3.640 6.220 0.967 1.7088 1.1848 4.750" .025 10.0"
Stock piston from a 1966 425 weighs 720 grams plus the pin at 220 grams for a total of 940 grams and has a 30cc dome which measures about 5/16" high and about 3.645" diameter at it widest.